Scooters are fun to use, for both adults and kids as well. Thanks to technological advancements, there are scooters suited for different kinds of needs. From kick scooters to the best electric scooters with seats. Things are now better than ever for all scooter lovers. If you have never experienced the joy of an electric scooter, then this is definitely the right time for you to do so. Conventional scooters are cool but electric ones will blow your mind away. Starting off our list is the Razor electric scooter with a seat. This scooter was designed with a deck made from bamboo. Most people love the bamboo deck design and find it quite stylish. Razor offers a scooter option for people who tend to carry luggage, bags or even go shopping with their scooter. Not only does this scooter have a luggage rack, but your purchase also gets you a basket for placing your items in. This makes things much more convenient for you and you’ll no longer worry about running errands anymore. You also have the option of removing the luggage rack and basket if you don’t wish to use them. 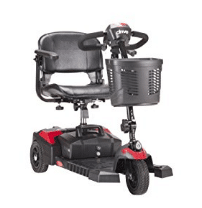 The scooter can for speeds up to 18 mph and it has a twist-grip acceleration control feature. The performance of its battery is great. You will be able to use the scooter continuously for up to 40minutes. This is more than enough time to finish up your tasks and come back. It uses 16-inch pneumatic tube tires and has a rear disc braking system. 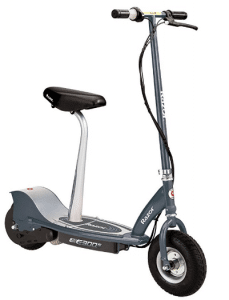 The scooter uses a 500-watt extra high torque motor. It comes with a 90-day warranty. Noisy scooters can be quite irritating. The Razor E300S electric scooter is exactly what you need if you want some peace of mind. The company designed it with an ultra-quiet chain-driven motor. No one around will be able to tell that you are riding on your scooter. It was meant to hold individuals with a weight of 220lbs or less. 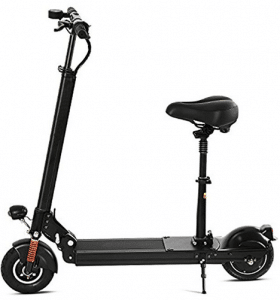 The scooter itself weighs about 52lbs and uses a 24V Seal battery system. This system lasts for a long time and is rechargeable. 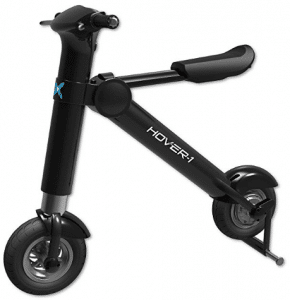 The scooter kickstand is spring loaded, and you will get to operate the rear brake using your hands. The company’s aim was to make the electric scooter compatible with different kinds of riders. That is why the deck and frame are super-sized can accommodate almost anyone. If you don’t feel like you need it, you can remove the ridding seat at will. This electric scooter with a seat takes up to 12 hours to get fully charged. The maximum speed the scooter can go at is 15mph. Ancheer decided to take your scooter experience up a notch. They went a completely different way and came up with some really innovative features. First of all, whenever you want to start riding your scooter or stop it, you will use the provided key switch. The scooter then has an onboard LED display which makes things more convenient than ever. Thanks to the LED display real-time data of your battery life will be available. Portability is another strong aspect that this electric scooter has. You can take it with you in your car or even put it in your closet. What makes this possible is the quick collapsible mechanism it was designed with. 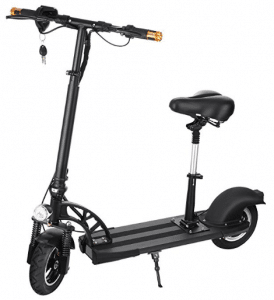 The mechanism turns it into a compact size, which downsizes the space the electric scooter occupies. Both the handlebar of the scooter and the seat retracts to make storage easy. The electric scooter allows climbing a 15% slope. Each charge will enable you to go for 12+miles. How fast do you like to go? Anfan has one of the fastest electric seat scooters in this review. 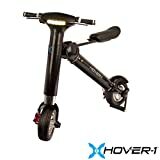 The motor used for it enables it to move at a max speed of 18.5-21.7mph. You can’t expect any less from a powerful 350/400W motor. The results you’ll get may vary depending on a number of factors. The scooter will perform differently with users who are of different weights. You need to also take different road conditions into account as well. The range of the distance covered per charge varies between 12.5-15.5 miles. One of the things Anfan dedicates itself to is user safety. That is why the company offers some advice to anyone willing to buy the scooter. You should ensure that you follow the local law and regulations as you use the scooter. The scooter is just meant to be a commuting tool. Doing any stunts on it may lead to the possibility of injury to you and damage to the scooter. 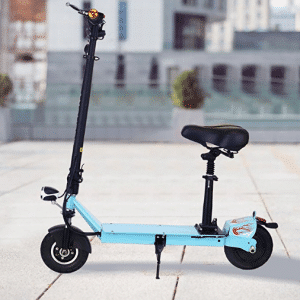 The scooter battery takes 5 to 8 hours to charge. The company has excellent customer support. When you use your electric scooter often, you get accustomed to it as one of your main commuting tools. This especially applies to short distances and errands. Because of this, one gets really impatient if the scooter runs out of battery power. You would have to find an alternative solution since you won’t be able to use your scooter. Asatr has come up with a way to counter this. 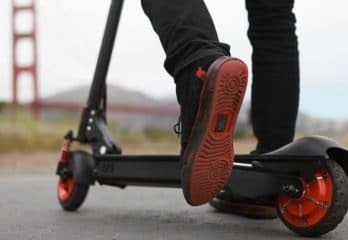 They designed a scooter which has the built-in 5-hour fast-charge technology. This is faster than the time it takes most electric scooters. Imagine being able to ride continuously for 120 minutes and not having to wait long before you could use your scooter again. The scooter has a headlight, multifunction electric HD LCD display, rear reflector, and a horn. The LCD display shows mileage, phone charge, cruise mode, mileage, phone charge, cruise mode, and temperature range. This scooter has 8-inch honeycomb puncture proof tires. Electric Scooter with Seat can be used on all-terrain. This is a great electric scooter for the household. It can be used by everyone, from adults to the children. Each member of the family can get a chance to have fun with it, as long as they learn how to maneuver it. What makes it user-friendly, is the fact that it can be adjusted depending on the rider’s needs. The handlebar and seat are made flexible for that purpose. The company also made the seat cushion and wheels shock absorbent. Shock absorbency makes the ride smoother and ensures the rider is comfortable for hours. 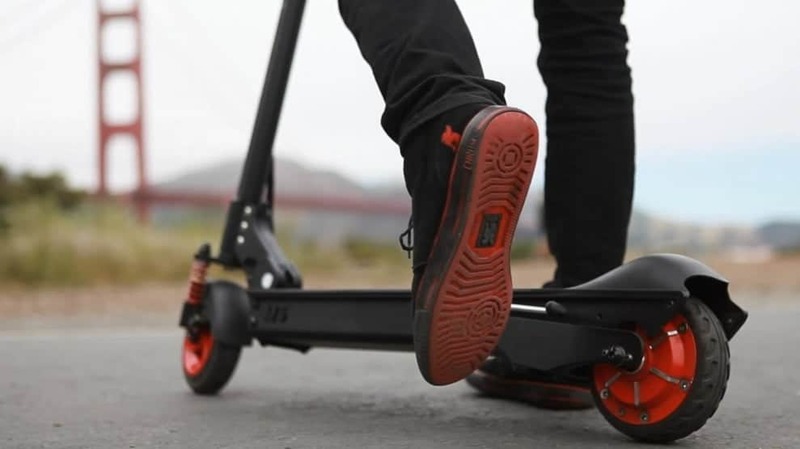 Once you make an order, the electric scooter will be delivered within 3-7 days. They are placed in a US warehouse for convenience purposes. The company strives to solve solutions for their clients within 24 hours. You will never get stranded with Kaluo. You can ride for 12-15 miles with a single charge. It was designed with a powerful 350/400W motor. Who wouldn’t want to keep their electric scooter looking good for as long as possible!? To do so, some people take extra caution when handling them. Drive Medical offers you a clever way to achieve this as well. You will be able to hide scuffs and scratches from people. This scooter has interchangeable color panels which will enable you to do that. The scooter’s assembly and disassembly will be quick and easy. You will find it very comfortable to use. The armrests are padded and can be adjusted to meet your needs. The backrest of the scooter's seat can be folded down and the swivel seat's height can also be adjusted. You will also get to use ergonomic throttle control and find the freewheel operation to be very easy. 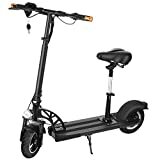 Electric Scooter with Seat comes with batteries which are quick connected. 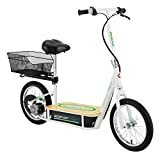 The wheels of the electric scooter are anti-tip and the tires are non-marking. The Hover-1 HY-HBKE XLS is recommended for use by people aged 14 and above. This is not your average electric scooter. It can be described as a motorized bike hybrid and heavy duty e-scooter in one. You won’t find another high-performance brushless motor like this one easily. You can ride it at a maximum speed of 20mph, and enjoy the scooters 22-mile range. Buying this speaker is one of the safest moves you could make. You will be lowering the risk of incurring financial losses. This is thanks to the electric scooters unique Key based system. The system offers security and prevents anyone who hasn’t been authorized from using or stealing the bike. Hover-1 also offers advice to their clients on how to achieve 2.5 to 3 hours of battery life. When you purchase the scooter you will get a guideline on the topic. The scooter has advanced safety features and transportation engineering. 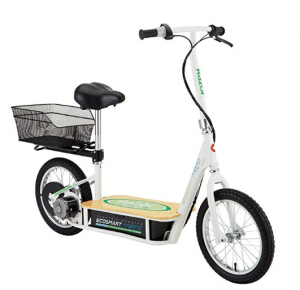 Electric Scooter with Seat has resettable circuits and fuses to protect the overall system. 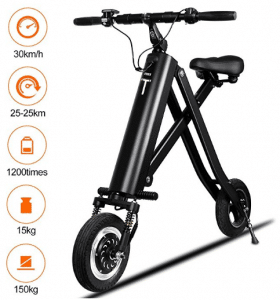 No other bike on this review is able to cover the same mile range as this electric scooter. You will get to go approximately 25 to 30 miles with it. The bike was designed with a dynamic seat shock absorber and double wishbone front hydraulic shock. This ride will be like nothing you have experienced before. You’ll even begin to think that all the roads simultaneously smoothened out. Buying this gets you safety and quality assurance. The scooter’s battery will not experience any fault. It’s powered by a Lithium-ion battery, which has a very long useful life, compared to what the market has to offer. You will get an ONE-YEAR warranty for the wheel hub motor and charger. The purchase gets you a TWO-YEAR warranty for the battery. The speed limit: buy an electric scooter with speeds with which you are comfortable with. Make sure you confirm the limit to know if it will be too fast or too slow for you. The battery capacity of the electric scooter: Get a scooter with a runtime which will not frustrate you. Some of them can run for longer periods of time than others. The weight limit the scooter can handle: The first thing you should always check is whether the scooter can support you or not. Things can get risky if you ignore the scooter’s limits. Comfort: You should be comfortable when riding. That’s why you should check if adjustments can be made and if the scooter has features like shock absorbers. They provide excellent support: if one is weak or tired, they can have a seat as they ride the electric scooter. They are easier to operate: Electric scooters do not need as much manpower as traditional scooters. Electric Scooters with Seat are convenient: You get to move around faster than you would if you were on foot. This marks the end of the best electric scooters with seat review. From the list, you have seen that some of the scooters are universal while others have restrictions. The kind of restrictions we are talking about is in terms of age. 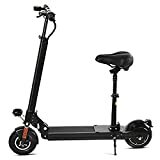 Are you the person who is going to use the scooter, or are you buying it for someone else? This is very important because it will help you avoid putting a kid or young person in harm’s way.